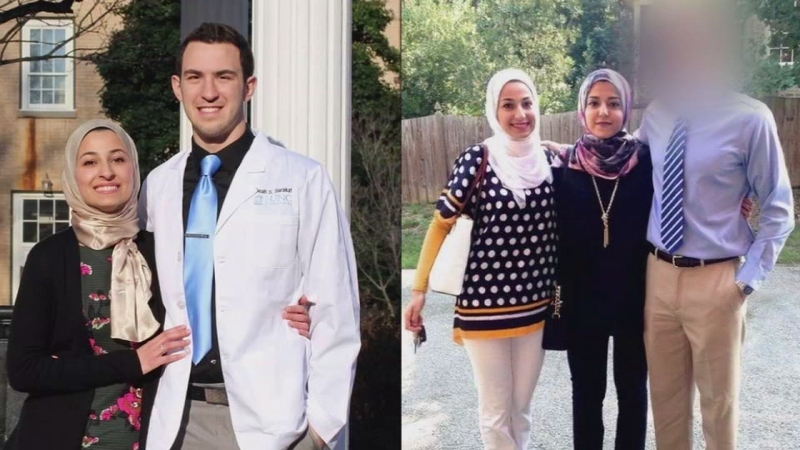 RALEIGH -- A man charged with killing three Muslim college students appears to have held his gun to the heads of two victims when he pulled the trigger after shooting the first in the doorway, according to autopsies released Wednesday. The reports on the Feb. 10 shootings in Chapel Hill show that 21-year-old Yusor Mohammad Abu-Salha and her sister, 19-year-old Razan Mohammad Abu-Salha, died of contact wounds to the head, indicating the gun was very close or against their scalps. Authorities have said suspect Craig Stephen Hicks got a .357-caliber handgun from his apartment; went to the door of the nearby apartment shared by Yusor Abu-Salha and her husband, 23-year-old Deah Shaddy Barakat; and shot Barakat after verbally confronting him. They say Hicks then went inside and shot the women in the head before shooting Barakat a final time as he left. Craig Hicks listens to his attorney. The autopsies indicate Hicks was standing over the women when he fired the fatal shots because the reports say the older woman was shot in the top of the head, the younger was shot in the upper back of the head, and the bullets traveled downward. Yusor Mohammad Abu-Salha also was shot in the front of the hip. Barakat died of multiple gunshot wounds. The autopsy reports said two bullets penetrated his head and two penetrated his chest, he was wounded in the arm, and he had multiple tangential wounds to his hands and head. A judge ruled last month that prosecutors can seek the death penalty against the 46-year-old Hicks, who's charged with three counts of first-degree murder. Hicks is being held at a state prison in Raleigh pending trial. Police have said Hicks appeared to have been motivated by a long-running dispute over parking spaces at the condominium complex near the University of North Carolina at Chapel Hill. But the victims' families say they were targeted because they were Muslim. Three people were shot to death in Chapel Hill Tuesday evening.